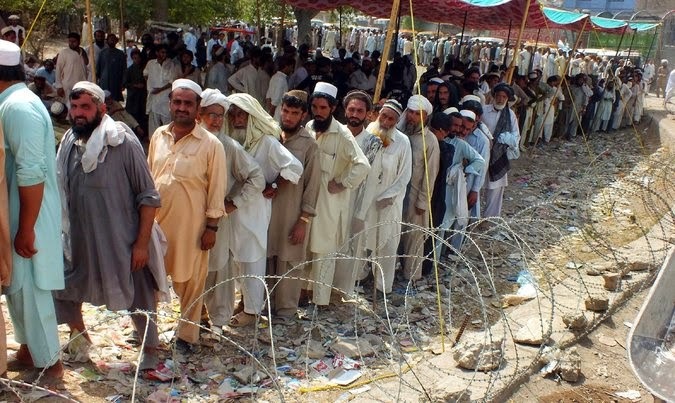 Pakistanis displaced by a government offensive waited for packages of food and cash in Bannu. Actually, there are two realistically available alternatives to US drone strikes. One alternative is to give the Taliban—both its Afghan and Pakistani wings—an undisturbed safe haven in the border regions of northwest Pakistan within which it can murder and intimidate its local opponents with impunity and from which it can launch attacks on civilians and other targets both in Afghanistan and the rest of Pakistan without interference. The other alternative is conventional military action by the Pakistani army, which has been rare but which does happen occasionally, usually when a major Taliban atrocity in Pakistan has prodded to Pakistani government into reacting. I don't mean to suggest that this comparison yields an easy and obvious conclusion. All three of these alternatives—US drone strikes, passive inaction, and large-scale military action by the Pakistani army—have serious moral and political costs and other drawbacks, and none of them really offers prospect of fully solving the crucial problems involved. People who oppose US drone strikes in the border regions of northwest Pakistan (and elsewhere) have emphasized the human and political costs of the drone program in very strong terms. Of course there really are such costs; and there is a plausible case to be made that, on balance, US drone strikes against the Taliban do more harm than good. But any serious consideration of the moral and political dilemmas involved would also have to take into account the consequences and implications of the realistically available alternatives. I don't think it's unfair to say that many opponents of US drone strikes fail to confront those dilemmas seriously, even when they don't simply ignore them. The advance was the army’s first major thrust into the center of Miram Shah, a hub of militant activity, and was an escalation after days of a relative lull in operations to allow civilians to flee. The military said that 456,000 displaced people had registered for aid, making it Pakistan’s biggest conflict-driven humanitarian crisis since a previous push against the Taliban in 2009. So far, the military operation has mostly involved airstrikes against remote militant compounds in North Waziristan that, a spokesman in Rawalpindi told reporters on Thursday, had resulted in the deaths of 327 fighters and just 10 soldiers. But the number and identity of those killed could not be confirmed because North Waziristan is effectively sealed off to the outside world, including journalists. Some fleeing tribesmen said the military strikes had killed civilians as well as militants. The next step, military officials said, is a major ground assault into the towns of Miram Shah and Mir Ali. “Both towns would be cleared in one go, simultaneously,” said a senior military official in Peshawar. But in Bannu, fleeing tribesmen indicated that many Taliban fighters had already left the area. Again, I'm not suggesting that any of this constitutes a clear or decisive argument in favor of continuing US drone strikes against the Taliban in these border regions of Pakistan. On the contrary, the point is that all the available options (or any combinations of them) are unattractive, unpleasant, and unsatisfactory. Their implications and likely consequences are complex, uncertain, and difficult to assess clearly. And all of them present difficult and intractable moral and political dilemmas. But any discussions of US drone strikes worth taking seriously should be willing to confront these moral and political dilemmas fully and honestly. Yes, life is complicated.